It is a bitter reality that an employee hired by you and working with you can steal from you. Taking discounts more than allowed or taking office supplies home happens often in offices, no doubt. But, if this stealing rises to the level of embezzlement, it is alarming for business owners. Embezzlement in accounting is not good for the health of your business. Many organizations and individual business owners face employee theft and embezzlement each year. Embezzlement is theft or bad actions by employees. According to a 2012 report from the Association of Certified Fraud Examiners (ACFE), “the typical U.S. business loses 7% of its annual revenues to employee fraud” and small businesses have the most cases and the highest losses. Embezzlement is unavoidable and happens in small, big, profitable and non-profit companies. No business owner wants to be the victim of embezzlement. Fraud affects the finances, image, and morale of the company. All factors decline after a fraudulent case. Most organizations adopt shortcuts for fraud prevention. These tactics only decrease the opportunity for fraud. Fraud deterrence is essential for all organizations. The bigger the organization, the more the chances of fraud increases. Frauds are as old as human history and can happen to any company or business despite the organizational structure and the number of workers. Small business managers trust their workers more than usual and, because of that, there may be weaker internal controls. 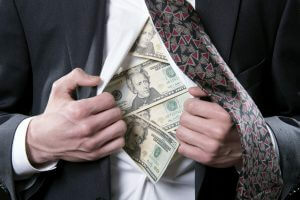 Studies show that embezzlement is the product of certain behaviors. In the ACFE’s report, 92 percent of fraudsters in cases studied exhibit behavioral warning signs before being detected. So, before you instigate a full-scale witch stalk for possible fraudsters, observe and look for the understated behavioral warning signs of embezzlement in your organization. Any unexplained and unjustified changes in bookkeeping records are warning signs for embezzlement in accounting. If there is a decrease in the revenues despite continuous payments from the business bank account, there are various pending payments for long periods of time without any justified reason, or if there are many unexplainable increases in expenses and a decrease in profits, it means that money is draining out of the company to a place where it is not supposed to go. An accountant who is fraudster will go to any extent for hiding his or her crime. More often than not, they want to work off hours when everyone has gone home. They refuse to go on leave or avail gazetted holidays. They may try to take work home. All of these activities are red alerts and need to be addressed. Keep an eye on such workaholics. In today’s busy and selfish world, some unfortunate individuals exert extra hours with bad intentions. Fraudsters try to hide many documents and processes from managers and others. If any manager or others try to get involved in their work, they become offended. Unsatisfactory explanations and answers are given by them on any fault. They are overprotective. They work alone and don’t like any involvement or interference. Records maintained by them become inaccessible and untouchable for others. When asked questions, they become overly defensive. In fact, they know that their records will unveil their embezzlement and their answers will be suspicious and unrealistic. If any accountant is facing any kind of financial stress in their life, they are more likely to plan embezzlement by using accounting records. Any unexpected financial loss like divorce, mortgage or debt act as the trigger for embezzlement. Know your employee by taking time for small discussion with them about their current situation. In this way, you can detect any kind of sudden change in their behavior and activities. Embezzlement in accounting and bookkeeping can happen to any organization. The above mentioned signs are useful in early detection. How Can Inventory Manufacturing & Accounting Software Help?